51 imp gal., 61.25 US gal., 8.25 cu.ft., 234 litres. All steel construction heavy gauge HRS, lid 16 gauge steel, body 18 gauge steel. 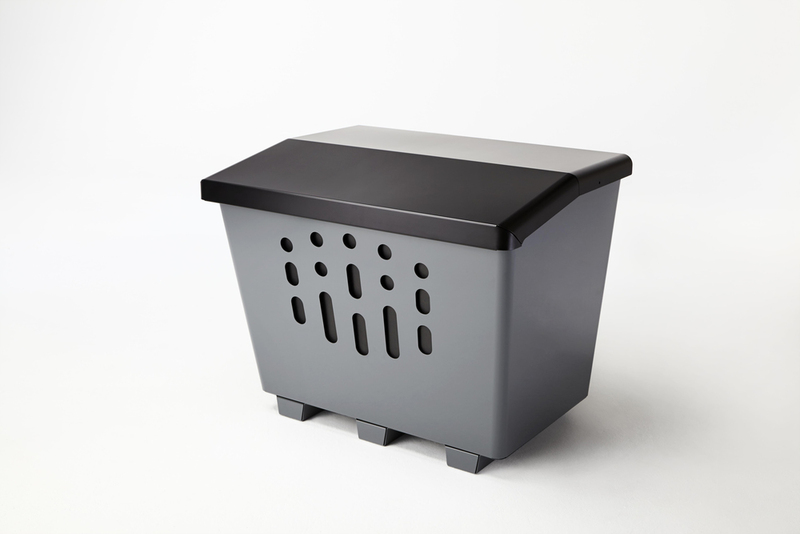 Rotationally moulded polyethylene storage liner included. Storage container has a counterbalanced lid for safe opening and closing and easy access. Lockable attachment included. Sealed storage compartment helps extend the storage life of salt or sand. Holds up to 750 lbs. depending on material density. Storage container is also perfect for storing chemical supplies, industrial tools and equipment, and any other items that require a lockable heavy duty storage solution. Hidden feet allow unit to be anchored to ground. Unique design of the storage container is part of a family of integrated products. Clean detailing in a rugged practical application. Perfect for use at office buildings, schools, retail outlets, and other commercial properties requiring maximum durability and attractive looks.